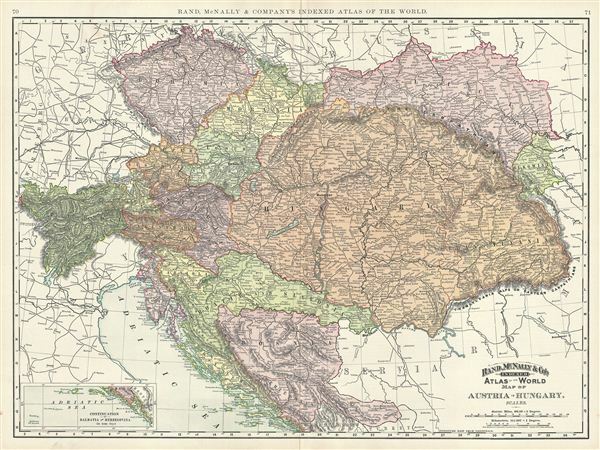 This is a beautiful example of Rand McNally and Company's 1891 map of Austria-Hungary or the Austro-Hungarian empire. It covers the territories claimed by the once vast Austro-Hungarian empire, including in whole or part the modern day nations of Austria, Hungary, Germany, Italy, Albania, Croatia, Romania, Bosnia and Herzegovina and the Czech Republic. An inset in the lower left quadrant features the continuation of Dalmatia and Herzegovina. The Austrian empire, founded in 1804 by the last Holy Roman emperor, Francis II, lasted only till 1866. It was transformed into the Austro-Hungarian empire after Austria was defeated in the Austro-Prussian War of 1866 and went on to become one of the 'Great Powers' of the time. The empire collapsed during the First World War. Color coded according to regions and territories, the map notes several towns, cities, rivers and various other topographical details with relief shown by hachure. This map was issued as plate nos. 70 and 71 in the 1895 issue of Rand McNally and Company's Indexed Atlas of the World - possibly the finest atlas Rand McNally ever issued. Rumsey 3565.017 (1897 edition). Philip (atlases) 1026 (1898 edition).